Starting seeds indoors in a sunny location or in a protected area on the patio is a good way to get the varieties you want in an economical way. 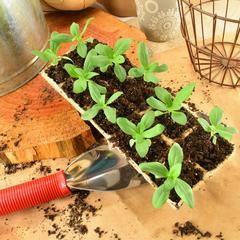 By using transplants, you may avoid wasting space in the garden rows where it is easy to have skipped areas when some seeds wash away or fail to emerge. Vegetables that are especially suited for planting from seed are peppers, tomatoes, eggplants and most members of the cabbage family, including broccoli, cauliflower and Chinese cabbage. Beans, corn, okra, cucumber, peas and squash do not always transplant well and it is recommended that you begin these crops by direct seeding. Additionally, root crops like beets, carrots, turnips and radishes are also more successful if you directly seed them into the garden soil. >> Planting time: Utilize the “Vegetable Planting Guide” developed for our area by horticulturists at the Texas A&M AgriLife Extension. The planting dates in the guide are based on planting from seed. For crops that have a long planting window, plan on multiple plantings about three weeks apart to extend the harvest time. >> Growing medium: Use a sterile, loose and fine, potting mix (no sticks), available at garden centers. >> Seed starting containers: Paper cups, newspaper pots, egg cartons and peat pots make excellent biodegradable containers. You can also purchase multi-cell containers to accommodate a larger amount of seed. Be sure to plant two to three seeds per cell to assure that at least one seed emerges. Large trays without individual cells are not recommended for starting vegetable transplants. When it is time to plant the seedlings, you do not want to untangle roots of these young plants to get them in the ground. >> Seeding: To be sure that seeds do not wash away, avoid over-filling containers. Wet the potting mix before adding seeds to be sure it is thoroughly moist. Bury seed two to three times greater than its width. For very fine seeds, package recommendations usually recommend gently pushing the seed into the top of the soil. This is especially true of lettuce seed. For some seed, a shallow layer of vermiculite on top of the potting soil, keeps seeds in place. Water very gently with a mister and avoid flooding the containers. It is likely that you will water these shallow containers every day, perhaps twice a day. >> Care of seedlings: Keep seedlings well ventilated, away from drafts and air conditioning vents. Keep soil moist. Once seedlings reach 2 inches or more in height, allow soil to dry a bit between irrigations. Seedlings need at least six hours of light per day. A grow light can be used indoors, but be sure to turn it off and give the plants a rest at night. Once seedlings set their second set of leaves, you will need to provide a mild fertilizer when watering. Fish emulsion or compost tea is good for young seedlings. Plant them into the garden when the transplants are 3 to 4 inches high. Next week I will discuss how to “harden off” young transplants to ready them for the move to the garden. For a copy of the “Vegetable Planting Guide,” visit hidalgo.agrilife.org and select “Gardening.” Scroll down the publications until you find the guide. You can also pick up a copy of the “Vegetable Planting Guide” at the Growing Growers Farmers Market from 9:00 a.m. until noon today in Firemen’s Park on the corner of 1st Street and Business 83 in McAllen. Master Gardeners are on hand to answer questions and to demonstrate how to make a paper pot. This is also a great activity for children to help with the garden. Barbara Storz is a local horticulturist. You can listen to her garden radio show at 7 a.m. Saturdays. Contact her by email at bstorz@rcommunications.com.